You know, I'm not a big fan of FaceBook. 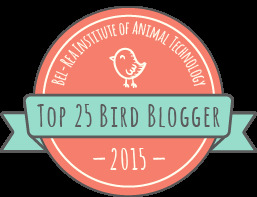 I use it because the birding community uses it. It took me a long time to figure out that there are "groups" that people join. (Actually, Di showed me the groups). I joined a bunch of bird groups including I Heart Shorbirds. It paid off this week. Notice the photo below - good ol' T7K. I've seen this bird on our beach alot. 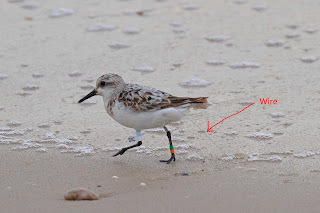 Most of the banded shorebirds that show up on my beach have the green flag like T7K but occasionally I find one with a different color. That's what happened on Labor Day. I went down to the beach to look for banded birds. T7K was there. So were others including an odd one that caught my eye. This one had many colored bands and a white flag. I chased it up and down the beach to get a good photo. What I didn't notice until I got home was the wire sticking out of the back of the bird. I enter all of my sightings and photos into a website called bandedbirds.org . After I enter them, I can search the database to see where they were originally banded and where they've been seen since. When I searched for 23C, no results appeared. Why? This bird is obviously the subject of a research project. Having no results, I went to the best place for answers - FaceBook. I posted the photos above with a question - Does anyone in the group know anything about this bird? The answers flowed fast and furious. One guy said that white flags mean that they were banded in Canada. Great info. The comments also agreed with my assumption that the wire is actually an antenna attached to a small transmitter like this one. You can see the wire. 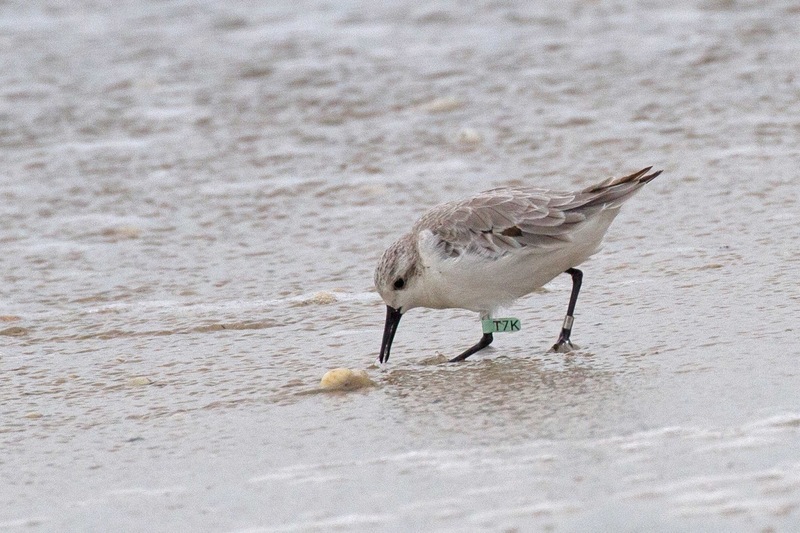 Someone said that the bird was probably part of this season's James Bay Research Project but we wouldn't get any info until the researchers returned from the tundra at the end of Sept. The Internet rocks. Just like that, researchers were posting to say that they knew the bird and shared the following info. 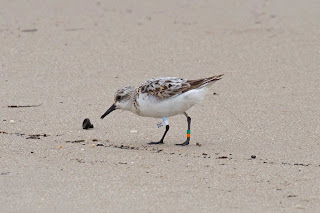 23C is an adult female Sanderling. And, she's also a Mom! Here is a photo of her nest taken on July 9th. Can you see the 4 pale green eggs? The posts kept coming in all day. Another researcher reported that our Super Mom successfully raised all 4 eggs into babies! Here is one of the babies with his/her own bands. Just a little ball of fluff really. 23C made her nest in a little scrape in the tundra way up in the high arctic. The researchers also posted a map showing the Polar Bear Pass National Wildlife Refuge which is on an island in Nanuvit territories in Canada. I added the mileage between the nest and the Villas beach. What a bird. 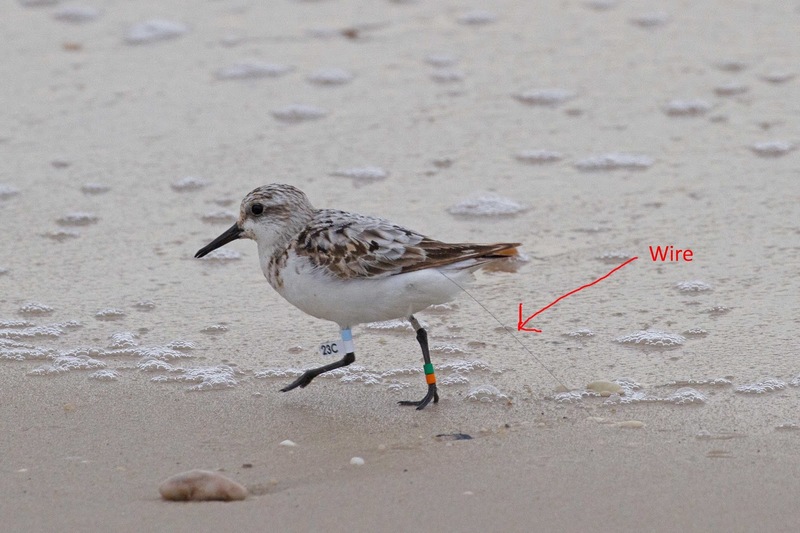 The researchers use the transmitter to track the bird's migration path but I'm sure that sightings on Villas beach are also helpful. I'll keep my eyes peeled for the babies. Wouldn't it be ironic if one of them showed up too? If you are at the shore, you know where to find me . . . on FaceBook of course! Wow this is fantastic. 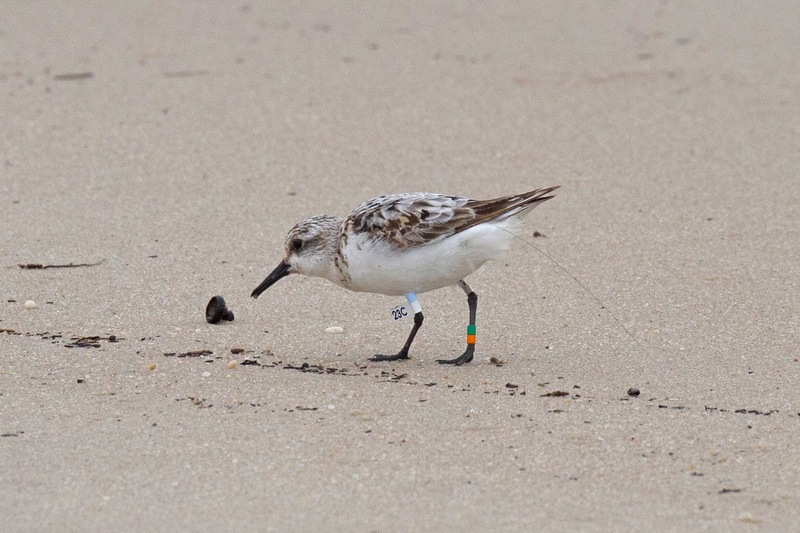 I saw shorebirds being banded and fitted with the transmitters last year in Cape May. It was neat to see them and now see the end result. How cool. Thanks for sharing your experience. What a terrific story. Thanks!